I feel lucky to be back home this Sunday evening with no harm done to me and with all my possessions intact. And I'm starting to seriously consider enrolling in some self-defense training because I know I might not be as lucky as I was today in future. Whenever someone in my network gets attacked by robbers, I always feel fortunate about the fact that I've never been assaulted in all my time in Lagos, let alone robbed. The worst nuisance I had experienced on Lagos roads was obstinate beggars and maybe, nasty bus conductors. Other than that, I've been okay. Alas, fate decided that today was to be the end of my lucky streak. Around 6 pm, I stepped out of the house where I'd been all day to have my first meal of the day. My destination was White House buka at Sabo, Yaba. I boarded an Okada whose route to Sabo went through the Onike area of Yaba. During this Okada journey, I made brief eye contact with one peculiar character. He's a raggedy old man who hawks mopsticks around the Onike-Sabo-Alagomeji area of Yaba. The first time I noticed him in the area was some two years ago when I lived and worked in Yaba. Seeing him every single day on the way to/back from work, doing the same apparently fruitless activity in his old age touched me deeply. So deeply that I actually considered eking out some living space for him in my then en-suite room. In the end, though, my kindness did not make it beyond my heart. Despite the persistent urge to do so, I failed to reach out to the man until I moved out of Yaba after quitting my job. Today, over two years later, he's still in the same 'trade'; same apparently unrewarding trade. From the look of things, the trade has not improved his life to any degree. Quite poignant, if you ask me (watch this video on my favourite YouTube channel to learn how to pronounce the word, "poignant"). We made eye contact in the brief moment that my Okada stopped just in front of him for traffic. I fumbled through the right pocket of my shorts for the 100 Naira notes the Okada man had given me for change. But before I found them, it was time to move. However, I made up my mind that I was going to have my first interaction with this old man today. 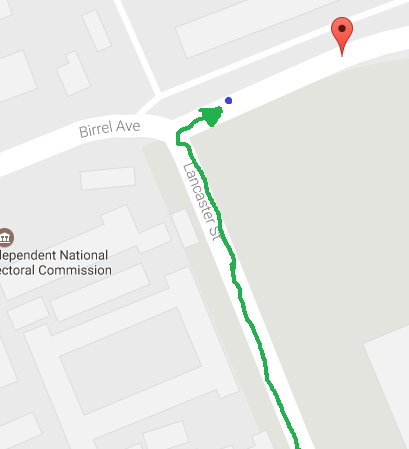 After downing my jollof rice, meat and water at White House, I retraced my steps back to the Birrel avenue junction where the old man sat behind the barracks fence (blue dot in above image). I walked up to him and as soon as I was close enough, I asked him how many mopsticks he had sold today. He sprung up excitedly from his seating position, regarding me as Oga (or something of the sort). I guess he didn't get my question even after I repeated it two more times. Because he went on to tell me the price of the two categories of mopsticks he carries: 500 Naira for the small one and 700 Naira for the big one. I asked him to show me the small one and the big one for conversation's sake. He pointed them out to me in his stack of about a dozen mopsticks + broomsticks. I failed to see any significant difference though; maybe because I wasn't paying attention. I handed him two of the three 100 Naira notes I had on me and continued on my way towards my house. Of course, the old man was very thankful for my kindness. Setting out of White House, I had planned to join a bus going to Abule Ijesha (nearest bus-stop to my house) once I was done with the old man. But it required me to walk backwards again to get to Sabo, the bus park. Since I had ample energy in me and a bit of free time on my hands, I took on the task of completing the approximately 2-kilometre distance back home on foot. I was midway on Barikisu Iyede street when this scrawny looking young man with dreads called me from the other side of the road. He seemed to be greeting me like someone I knew. After a quick scan, however, I concluded that I had never met him. Nonetheless, I responded and waved back at him. This seemed to have excited him, judging from his body language, as he beckoned me to wait for him while he prepared to cross the road over to my side. I kept walking. Him: "Bros, I'm just greeting you now". Me: "Ok, that's fine. I already answered you now. Is there anything else I can do for you"? He moves closer, touches my bare shoulder (I was wearing a tank top) a couple of times in an overly friendly gesture. This makes me feel very uncomfortable so I take two steps back, telling him with a straight face and stern voice: "Hey! Don't touch me. You don't know me"! Him: "Bros. You be my guy o. Na why I say make I tell you say next time, make you no wear this kind colour again". For a second, I look down at my tank top to confirm it wasn't camo or any other conspicuous colour associated with some occult group. It wasn't, so I was really confused at this point. Just when I was going to reply him, perhaps to ask for clarification, I saw in my peripheral vision, another young man cross over from the other side of the road to join us. As soon as he was on our side of the road, the first thing he said was, ""Bros. How far! Do you know who I am"? At this point, I was sure this pair of guys were hoodlums and were up to no good. They'd had my attention for an entire minute and not said anything of import. Without as much as another word, I made an about turn and continued on my way home, in my regular brisk but confident pace. I definitely was not going to let this little threat rid me of my confidence. A quick look over my right shoulder a few seconds after let me know that I was being followed. I'd say the malicious pair followed me for about 4 minutes before branching off the long stretch of road that Barikisu Iyede is. My hope was in getting to the police truck which is usually stationed on University road, just by the end of this street. During my walk, I was busy imagining how painful a stab wound could be and wondering if I'd still be able to defend myself after such an injury. I was close to the NSPRI guest house (see the green spot in above map) when I looked back over my shoulders after about two minutes of ignoring the guys. I noticed the pair had disappeared from behind me. 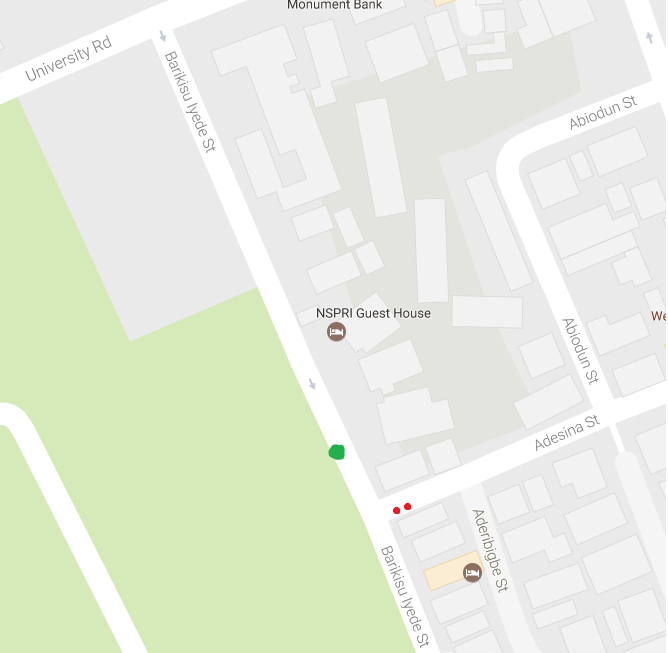 A second later, I saw them in the distance (see two red dots in above image), just as they were disappearing into Adesina street. Fantastic I thought, I got them off my back. A wave of relief hit me. Any recommendations for effective self-defense training, so my heart rate won't go as high as it did yesterday due to my biology preparing me for the worst outcome? I'd be happy to hear from you.